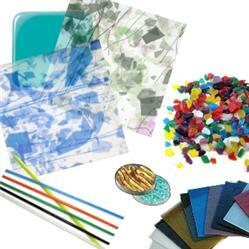 It can be difficult to choose glass for your stained glass project. 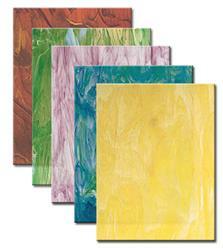 If you are a beginner, we recommend Spectrum Glass because it's the easiest to cut, in general. The surface is very smooth, and it's machine made so it has a very consistent quality and texture throughout. Wissmach glass is a bit harder to work with, but has a more "authentic" look to it. It is more of a handmade product, and they've been making glass this way since 1910. The Wissmach Glass website has some interesting history and photographs you might enjoy. Youghiogheny Glass is the hardest to work with, but is the most beautiful, frankly. We use it in our Tiffany Reproduction lampshade kits. The Stipples are especially suited for lampshades and large windows, as they are perfect for flowers, skies and water. Several carefully chosen assortments to suit a variety of needs. The most economical way to buy glass. The pieces are irregularly shaped (but mostly rectangular) up to about 6" x 8". We cannot fill orders for specific shades or textures at these low prices. Of course, if you are in the vicinity of our store, you can come in any time we are open and root through the bins looking for the special texture you need. Price is per pound. If you order one pound of remnants, you will receive enough pieces to just about cover a sheet of 8-1/2" x 11" writing paper. Some are subtle, some are downright psychedelic. 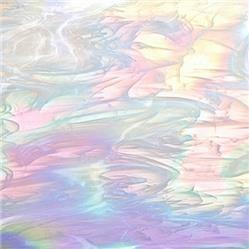 This is basically cathedral glass - very transparent - with swaths of opal swirled into it. Cathedral, or transparent, is available in several textures: Aqua-Lite, Double Rolled (a.k.a. Smooth), Flemish, Granite, Hammered, Moss, Seedy, Seville. 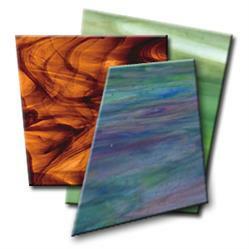 Wissmach's Streaky (-LL) is manufactured by adding a color or colors to a clear glass base, creating streaks of color throughout the sheet. Wissmach "Wisspy" (-WO) has more translucence than Light (-L) or Dense (-D). Gorgeous stipple glass from Youghiogheny, ideal for Tiffany-style stained glass lampshades and windows. Also called catspaw, this is very dense mottled opalescent. 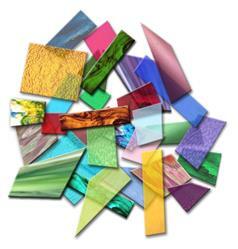 Our collection of fusible glass includes some System 96 from Spectrum and Uroboros, and a large selection of beginning fusing materials from Fuseworks. A machine made, smooth surfaced glass in pastel shades which bears a resemblance to sheet antique glass, but which is priced much less. Also called architectural glass, clear textured glass is ideal for transoms, sidelights, or anywhere that you want light to enter but still want a bit of privacy. From Uroboros Glass in Portland, Oregon. 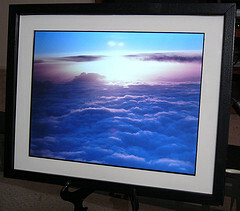 A thin clear glass used in picture framing work. 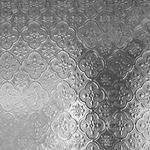 Silvered window glass 1/8" thick. Also, front surface mirror. Assortments of scrap cathedral, opalescent and some antique glass in many colors.